Notes on the emergence and development of the international human rights movement. A framework for collecting, preserving, and disseminating human rights-related materials. A roundtable discussion sponsored by the MacArthur Foundation on the role of research libraries in the collection, preservation, and dissemination of human rights documentation. A recent conference at Columbia University, on Human Rights Archives and Documentation. The newspaper Aquí and the human rights struggle in Bolivia during the 1970s and 80s. CRL human-rights related collections and archives: the adjudication of World War II era crimes against humanity in Europe and Asia. CRL collections supporting human rights research in: Africa, Latin America, South Asia, and Southeast Asia. 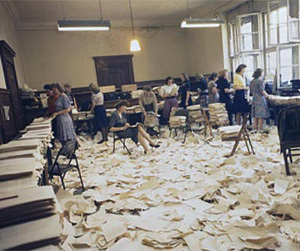 The mimeograph room in the Palace of Justice during the Nuremberg Trials in 1946. From Stadarchiv Nuremberg/United States Holocaust Memorial Museum.